Trying to find your gateway into modern DJing? Look no further than the MDJ-500 Professional Media Controller. It may be small, but this mighty unit has plenty of capabilities without the need for external software. A large 4.3-inch vivid full-colour screen is the brilliant focal point of this unit, providing real-time visual feedback of your tracks. Full track information including Title, Time, BPM, and Pitch are clearly displayed alongside the precise full-size waveform window. You'll appreciate the additional visual feedback for Slip Mode, Hot Cues and active Loops meaning you can confidently use scratches or hot cues without ruining your mix. The 100mm pitch fader ranges pitch from 4% to 100%; you'll mix with surgical precision. The MDJ-500's intuitive interface will have you spending less time learning and free up precious time for you to experiment with the 4 Hot Cues, 8 Auto Loops, and the 5-inch touch-sensitive jog wheel with LCD display and resistance control to Slip and Scratch. Bonus MIDI capabilities mean you can even control the parameters of your favourite DJ software directly from the unit, routing your audio through its 24-bit/192kHz soundcard. Of course, the MDJ-500 is fully compatible with our V-Case Library Management Software, which offers users a faster, easier way to manage their music libraries. Notes: Trying to find your gateway into modern DJing? Look no further than the MDJ-600 Professional Media Controller. It may be small, but this mighty unit has plenty of capabilities without the need for external software with its USB, MIDI and CD compatibilities. A large 4.3-inch vivid full-colour screen is the brilliant focal point of this unit, providing real-time visual feedback of your tracks. Full track information including Title, Time, BPM, and Pitch are clearly displayed alongside the precise full-size waveform window. You'll appreciate the additional visual feedback for Slip Mode, Hot Cues and active Auto/Manual Loops meaning you can confidently use scratches or hot cues without ruining your mix. The 100mm pitch fader ranges pitch from 4% to 100%; you'll mix with surgical precision. The MDJ-600's intuitive interface will have you spending less time learning and free up precious time for you to experiment with the 4 Hot Cues, 8 Auto Loops, and the 5-inch touch-sensitive jog wheel with LCD display and resistance control to Slip and Scratch. Bonus MIDI capabilities mean you can even control the parameters of your favourite DJ software directly from the unit, routing your audio through its 24-bit/192kHz soundcard. Of course, the MDJ-600 is fully compatible with our V-Case Library Management Software, which offers users a faster, easier way to manage their music libraries. The CDJ-2000NXS2 inherits all the best features from its predecessor - the CDJ-2000NXS - and takes a giant leap forward. We've added a larger, multicolour touch screen with a Qwerty keyboard and search filters to help you select tracks faster. 2 banks of 4 Hot Cues give you more creative freedom, while a 96 kHz/24-bit sound card and support for FLAC/Apple Lossless Audio (ALAC) means you can play with higher resolution formats. Download the rekordbox music management software or the rekordbox app to prepare your sets. Notes: The CDJ-350 will allow users to create DJ performances with various digital music files including MP3, AAC, WAV and AIFF files that are stored on different forms of media, including USB mass storage device class products or CD-R/RW discs. The media player also includes Pioneer's proprietary music management software, rekordbox, making it possible to manage music files on a computer for quick song selection when played back on compatible Pioneer players. The pearl white CDJ-350-W is a quality entry-level DJ deck that will play all professional and popular formats on CD or USB. It really comes to life when you connect with your computer. 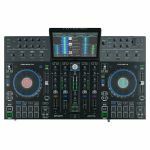 It's USB connection allows for plug & play control of compatible DJ software, plus MIDI control for any music software. Also, you can use your CDJ-350-W as an audio interface. With the deck comes Rekordbox; Pioneer's music management software that analyses the BPM and beat position of songs in your library. When you have finished preparing, you can transfer your songs and playlists to a USB device so you can select them by album, artist or genre on your CDJ-350-W. In an industry first feature, DJs can create and edit playlists right on the player. BPM lock lets you match tempos of songs with just one button for smooth transitions. Set a master BPM for each deck and all music will be played at that speed. Check the beat both by sound and vision with the beat display function, which facilitates scratching and looping. With the auto beat loop function, you can develop loop performances with beat loop, loop divide and hot loop functionality. 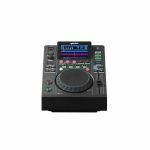 Notes: The CDJ-900NXS has a large screen with the highest resolution of any CDJs, which displays a host of track information and features inherited from the CDJ-2000NXS. DJs can choose how they view tracks - list, artwork, or custom view - and scroll through using the large rotary dial. In addition to Wave Display, Wave Zoom*1 enables even more precision on loops and cues. DJs can use rekordbox to mark key points on a track, and the CDJ-900NXS counts down to them from up to 64 bars away. Shows the position of the beat in the bar, enabling DJs to compare the phase of each player with the master deck at a glance. This information can be displayed simultaneously on other Multi Player connected via "PRO DJ LINK"
Music files can be analyzed with "rekordbox" installed on a computer, music can be managed (settings, create/edit, save logs) in a manner that is suitable for DJ performances, and the music to be used can be prepared in advance. By using the iOS version of "rekordbox" (download from the App Store free of charge), preparation of music can be done anywhere with your iPhone/iPod touch/iPad devices. Android version of "rekordbox" (download from Google Play free of charge) for Android OS devices as well. - Data analysis of music files "WAVE ZOOM", "KEY", "WAVE", "BEAT GRID", "BPM", "ID3 TAG", etc. 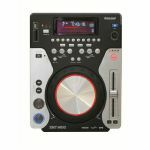 Music stored inside Wi-Fi/USB-connected iPhone/iPod touch/iPad devices can be transmitted to the "CDJ-900NXS for DJ performances. The touch panel displays of these devices can be used for intuitive operations. In addition, the enclosed Mac version of "rekordbox" can be used to send music to the "CDJ-900NXS" from inside a Wi-Fi-connected Mac. Also, when connected via USB, the iPhone/iPod touch/iPad devices can be charged during a performance. Android OS devices and Windows PCs also can send music via Wi-Fi/USB connections. The CDJ-900NXS boasts professional quality audio circuitry and an onboard sound card, for a clear, powerful sound even at club volumes. A precision engineered Wolfson DAC reduces jitter, while the player's signal-to-noise ratio of 115dB ensures incredibly accurate sound reproduction. Notes: We've upgraded one of our most popular USB-only multiplayers to create the XDJ-1000MK2. The new player inherits even more features from the club-standard CDJ-2000NXS2, including its 7-inch full-colour high-resolution touch screen, enhanced track browsing functionality and support for playing high-quality FLAC and ALAC files. Quickly finding the perfect track to play next is easy thanks to Track Filter, which filters tracks by BPM and key, and the new Matching feature displays suitable tracks you've previously tagged in Rekordbox when they're mixed with the track that's currently playing. - CDJ-style design, the XDJ-1000MK2 delivers a performance experience just like the club-standard CDJ-2000NXS2. Large jog wheels and a 7-inch colour touch screen give you intuitive control over your mix. - High-quality audio files supported among various formats including the addition of FLAC and ALAC for high-quality sound, as well as MP3, AAC, WAV and AIFF files. You can play tracks prepared in Rekordbox directly from your USB storage devices, or from your laptop by using Rekordbox, or from your smartphone/iPhone or tablet by using Rekordbox mobile for Android or iOS. - Matching: Audition tracks in Rekordbox before your performance and mark the ones that mix well together. When playing one of those tracks in your set, the XDJ-1000MK2 suggests matched tracks to play next. - Track Filter: Refine your track search by filtering tracks by Rekordbox information such as My Tag, as well as BPM and Key. Touch the screen and you can easily find related tracks to fit into your performance. - Search: Bring up the Qwerty keyboard on the touch screen to search for tracks quickly by name or keyword. - Hot Cues: Instantly start playback at a preset point. Up to eight Hot Cues can be set in advance to give you even more choice in the mix. - Quantize: Cue and loop points on tracks that have been beat-analysed in Rekordbox will automatically set in time with the track you're playing. You can fine-tune the Quantize value even more accurately for total control. - MIDI controller interface: Connect the DDJ-SP1 controller with a USB cable for tactile control of numerous features of the XDJ-1000MK2, including Hot Cues, auto loops and Slip Mode. One DDJ-SP1 can control up to four XDJ multiplayers using Pro DJ Link. - Link Export: Connect your laptop using a USB or LAN cable to play tracks directly from your Rekordbox library instead of using a USB device. - Beat Count and Phase Meter: Use Rekordbox to mark key points on a track, and Beat Count will count down the beats to them from up to 64 bars away. Phase Meter shows the position of the beat in the bar, so you can compare the phase of each player with the master deck at a glance. - Beat Sync: Hit the Beat Sync button and you can align the beat positions and BPMs of tracks (that have been beat-analysed in rekordbox) playing on two multiplayers connected by Pro DJ Link. - Rekordbox ready - use Pioneer's Rekordbox software to manage and prepare your tracks on your PC/Mac, tablet, smartphone or iPhone and use the XDJ-1000MK2's features for creative performances on the fly. - High-quality audio - the XDJ-1000MK2 inherits high-quality audio design from the CDJ-2000NXS2. As well as analogue output terminals, a digital output sends audio without degradation, and the power supply circuit for analogue audio is completely separate from the digital circuit, reducing unwanted noise. Notes: The XDJ-700 comes with a large touchscreen, a familiar club layout and it inherits a host of features from its big brother, the XDJ-1000. Its compact size and removable stand offer great set-up possibilities for even the smallest booth or home set-up. With support for our free rekordbox software you can prepare and manage your tracks on a PC or Mac before hitting the booth. Automatically beatmatch up to 4 playing decks. Works with music that has been beat-analysed by rekordbox. 'My Settings' allows you to prepare your system's setting preferences in rekordbox and save them to USB, SD, smartphones and tablets. This way you can instantly switch to your own settings when alternating DJs in the booth.